November is the month where people who love cooking get to shine, with a holiday devoted to food. The crowning achievement for a traditional American Thanksgiving is a turkey, moist and flavorful with crispy browned skin. Over the years I have tried a variety ways of cooking turkeys and this recipe was the clear winner. What have these cooking adventures involved? Brining kept the moisture but caused problems with thawing in time and meant finding a gigantic pot that fit the turkey and also fit into the fridge. Covering the top in a lattice of bacon was fun but the turkey didn’t cook evenly. Stuffing butter under the skin added a nice flavor – but was kind of gross to do, took a lot of time, and in the end the recipe below turns out much better turkeys. I’m not into poultry explosions so deep-frying is not on the list. I have duplicated this recipe many times with great success, and I am confident that you too can make the perfect Thanksgiving turkey. Go ahead, be brave, you can DO THIS! First, it is important to choose a good turkey. Turkeys without added stuff of any kind are best (the brine that they inject before going to the store, ick, you do not want to eat that). Bonus points if you have access to a local farm and can purchase a turkey directly – local happy turkeys always have the best flavor. They also tend to cost twice as much, but if you can afford it, I think it’s worth the splurge. Fresh turkeys are pretty awesome but let’s face it, most of us don’t have that kind of planning time available so we are facing a frozen rock of a bird. That’s okay. Let’s make it amazing! Around 14 pounds is the perfect size. The giant turkeys take so long to get the center to the right temperature that the outside meat is overcooked. Smaller turkeys means not much is available for leftovers. 14 lbs gives quite a bit of meat and is done after only three hours of baking (13 minutes per pound), which means lots of extra oven time for side dishes and pies. We know Thanksgiving is about the turkey, but it’s also about the pies. When the turkey is done and comes out of the oven, make sure to save the pan juices. Some can be used for making gravy while the bird is resting, and save some to pour into the leftover containers with the turkey to keep it moist in the fridge. This method works perfectly for roasting whole chickens too, just use a little less salt, and use your meat thermometer to test for done-ness. *On choosing wine: Mostly any kind will work – if it tastes good to drink, it’s probably the right kind. If it tastes awful to drink, you should not cook with it, just throw it out. Most stores have some decent stuff for $8-$10/bottle. Not 21 yet? Just use turkey broth. It’s all about the flavor! Even chicken broth will work in a pinch. Don’t use beef broth though, the flavors are weird together. Sturdy roasting pan – Don’t use a disposable foil one, they tend to collapse at the worst possible moment. Meat thermometer – This is how you know your turkey is done. It is very important. Baster – Those giant eye-dropper looking things. Cheap is fine. Hot pads and/or oven mitts to protect your hands. [3 to 4 days before roasting] Take your frozen turkey out of the freezer and put it in the fridge on Saturday or Sunday the weekend before Thanksgiving so it has time to thaw but not enough time to go bad. If you are getting a fresh turkey, do not pick it up more than 1-2 days before roasting day (Thanksgiving). [1 to 2 days before roasting] On Tuesday or Wednesday, salt your turkey. Pre-salting is an important key that helps the skin to crisp and the meat stay moist. Take the turkey out of its bag and put it into a roasting pan that will fit in the fridge. Save the bag to write down the exact weight of the turkey so you know how long to cook it for. Reach into the cavities and pull out the neck, and the plastic bag full of giblets. These may still be frozen, that’s fine. If you may want to make gravy with them, stick those in a ziplock baggie in the fridge. Don’t think they aren’t in there, they are, and you do not want to discover them while carving your turkey. Sprinkle 2 Tablespoons of salt and 1 teaspoon of black pepper all over the turkey. Make sure to include the back, breast, and meaty thighs. Refrigerate UNCOVERED until it is ready to go into the oven Thursday. It seems like this is too much salt but it is just right for a 14-lb bird. [Two hours before roasting] Remove the turkey from the fridge and place it breast-side up (the normal way) on a sturdy roasting pan. Let it sit someplace out of the way. If you have pets, you may want to assign someone to watch the turkey so it stays out of harm's way. [30 minutes before roasting] Preheat the oven to 450 degrees F. Put herbs and spices over the top of the turkey (I never measure these, just sprinkle until it looks good to you) and fill the cavity with quartered pieces of onion and apple or squash or whatever you like. 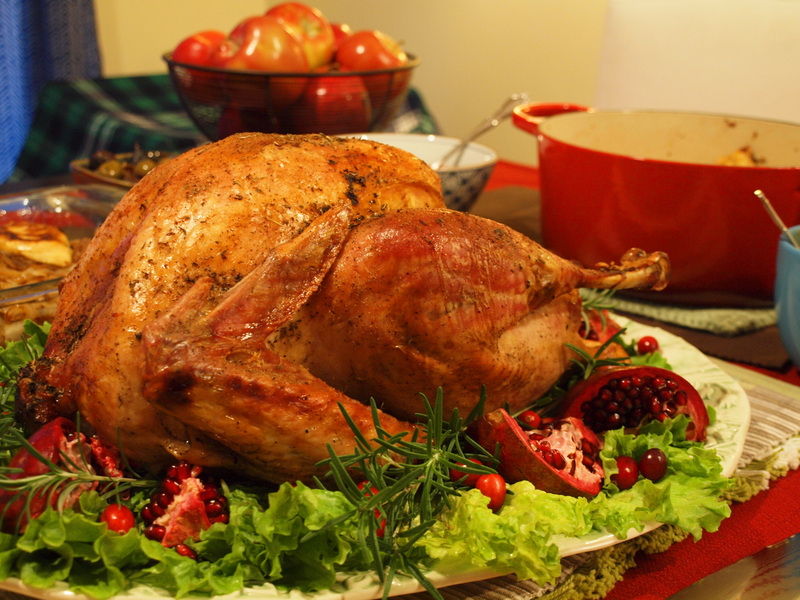 To avoid poisoning your guests, do not fill the bird with stuffing (don't let anybody eat the onion/apple either). [Roasting time] (3 ½ to 4 hours before eating time) When the oven is ready, slide the roasting pan into the oven and add 1 1/2 cups of liquid. Immediately turn the temperature down to 350 degrees. After an hour and fifteen minutes, rotate the pan and baste the turkey with pan drippings. This helps turn the skin brown and pretty. Baste every 45 minutes or so after this. If the skin starts getting too dark, that's when to set up an aluminum foil turkey-tent. (If you bake pies, it's the same idea as covering the edges of the pie crust). To use a turkey baster, just fill the liquid up about halfway; getting the whole thing to fill up seems like a good idea until learning that the rubber bulb is not heat proof and the liquid is 350 degrees. When the time is getting close to that 13-minute-per-pound mark (ignore the turkey timer that may have come with the turkey, those are often wrong) start checking the thickest part of the turkey meat with a meat thermometer. When all spots in the turkey reach 170 it is safe to eat and take it out immediately; extra cooking time beyond doneness is only harmful to your delicious turkey. Let the turkey REST for 30 minutes before carving it, to allow the proteins to cool and firm up so the turkey better retains its juices. This is the time to make gravy with the pan drippings. When making gravy, save some pan juices to pour into the leftover containers with the turkey to keep it moist in the fridge. This entry was posted in Dinners and tagged chicken, fall, thanksgiving, turkey, winter.